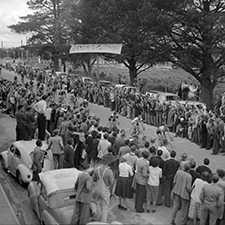 The first Tour in 1952 was the first professional stage race held in Victoria since the 1934 Centenary Thousand Classic. An estimated 500,000 people throughout Victoria saw the ‘Sun Tour’ as it was known then. 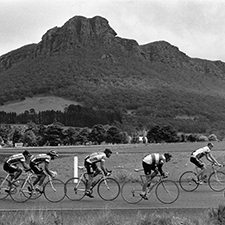 Of the 56 starters, only 18 finished the six-day event throughout Victoria. The winner was Keith Rowley, a Maffra sheep farmer, with a time of 42hr 57min 55sec. He beat his brother Max by 49sec to win. 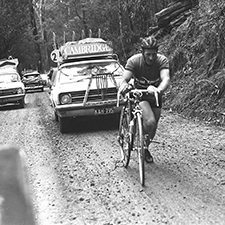 At the back of the peloton, 19-year-old Roy Underwood, the youngest rider in the field, spent five of the six days arriving at the finishing towns in the dark. His father made a £50 bet with him that he would not finish. The Saturday stage saw a search party sent to find him. After finishing the last day’s stage his father handed him 10 crisp £5 notes. The total prize money was £1500. 63 editions done and the Tour is now cemented as a significant event within Victoria and cycling. With significant support from key Tour sponsors, including Jayco and the Victorian Government, this iconic event now demands daily electronic and print news coverage as the stars of today and tomorrow go head to head in the battle for supremacy in Australia’s oldest stage race. The Tour became a part of the State Government hallmark events calendar in 2005, with an injection of State funding to support the growth of the event and development of the Tour. A major revamp with a new business plan, new management team and enhanced world ranking has laid the foundation for strong growth with dramatic increases in numbers of riders and entourage, global media coverage and dramatically increased local coverage through free to air TV and FoxSports. 2012 Tour de France champion, six-time world and Olympic champion Bradley Wiggins won the tour in 2009, further highlighting the quality of riders required to win this prestigious event. After his 2009 win he said “If I was going to pick a tour to win other than the Tour de France, the Jayco Herald Sun Tour is the one”. After a year off in 2010, during which Melbourne and Geelong hosted the UCI World Road Cycling Championships, the 2011 Jayco Herald Sun Tour was won by the talented domestic rider Nathan Haas. His win saw Haas signed to the Garmin Sharp team. Victorian Calvin Watson celebrated his 20th birthday in the best possible fashion, becoming the youngest ever winner in 60 editions of Australia’s oldest stage race when he took out the 2013 Jayco Herald Sun Tour. In the 2014 and 2015 ORICA-GreenEDGE took out back-to back victories with Simon Clarke and Cameron Meyer. The Tour is now a major international race and generates significant economic impact and media exposure for the towns involved. Australia is also one of the world’s foremost cycling nations, and the success of riders such as Brad McGee, Baden Cooke, Stuart O’Grady, Robbie McEwen, Cadel Evans, Trent Lowe, Nathan Haas, Jack Bobridge, Simon Clarke and Matt Wilson has given Australian riders and events great credibility and interest globally.